We offer a wide variety of packaging options for our quality fruit and continually work to support your unique needs for effective packaging. Our fruit is packed with state-of-the-art technology into high-impact and sturdy packaging to the utmost industry standards. 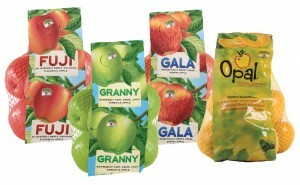 We offer a variety of packaging including standard polybags and promotional polybags. Our high-graphic ultramesh bags are variety specific and offer a more environmentally friendly choice with 25%-45% less plastic compared to traditional poly bags (3# and 5# comparisons).